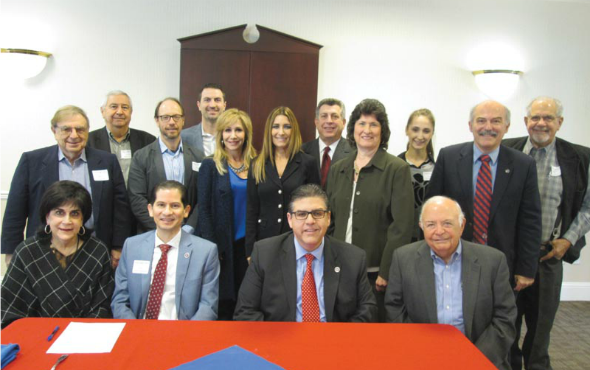 FRESNO, Calif.—The President’s Armenian Leadership Council of Fresno State held its inaugural meeting on March 2 at the Smittcamp Alumni House on the Fresno State campus. Fresno State President Dr. Joseph I. Castro welcomed the Leadership Council members to the breakfast meeting and emphasized the significance of the Council and its future activities. The purpose of the California State University, Fresno President’s Armenian Leadership Council is to serve as a liaison to engage the Armenian Community, support the Armenian Studies Program at Fresno State and advise the President on University, regional and global matters. Dr. Saúl Jiménez-Sandoval, Dean of the College of Arts & Humanities spoke about the mission of the College and about the role of the Armenian Studies Program, which is housed within the College. Leadership Council members were actively involved in the meeting, adding their comments and questions. Program marks its 40th anniversary with a Banquet on March 19. Dr. Sergio La Porta, Haig and Isabel Berberian Professor of Armenian Studies at Fresno State gave an update on the Armenian Genocide Monument at Fresno State, reporting that an endowment was being created for the maintenance of the Monument. The members of the Leadership Council are: Debbie Adishian-Astone, Dr. Varoujan Altebarmakian Professor Arakel Arisian, Shirley Melikian- Armbruster, Justice Marvin Baxter, Jane Bedrosian, Professor Barlow Der Mugrdechian, N. Leon Dermenjian, Dr. Janice Emerzian, John Gahvejian, Dr. Arnold Gazarian, Professor Sergio La Porta, Jacqueline Lion, Phil Maroot, Warren Paboojian, Kenneth Peters, Hon. Charles (Chuck) Poochigian, Victor Sahatdjian, and Marine Vardanyan.The initial term of this Leadership Council is February 1, 2017 to June 30, 2020 and the Council will meet at least twice each year.